In small towns and big cities across the country summer means baseball. Kids everywhere are taking to the fields, parks and vacant lots to take part in this timeless tradition. 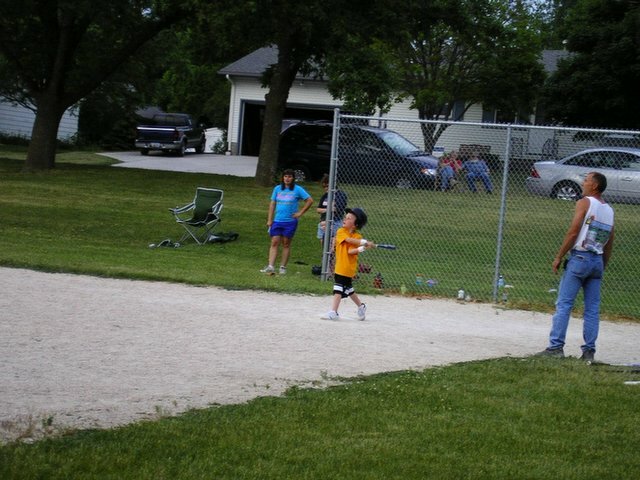 We are so lucky that West Bend has an excellent T-Ball program for kids age 5-8. The parents volunteer to coach and many towns-people show up to watch the kids learn how to play ball. I was thrilled to find out that they actually pitch the ball before using the T to get the kids used to being pitched to. It's surprising how many of the young ones can actually hit the pitched ball. They also rotate the positions each child plays so they get a feel for every position. As well as learning the game, the children also learn sportsmanship. Everyone takes a turn batting, catching and throwing. Then, at the end of the game, they line up to "congratulate" their opponents with a high five and a "good game". Small towns especially rely heavily on sports for activities for their children. I can think of no better activity for a 6 year old to partake in than summertime baseball. In the picture there? 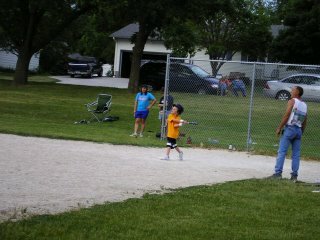 That's my grandson, Quinten, hitting it out of the park! He's a natural. But, why wouldn't he be - his first word was "ball"!